So you are having a hard time keeping your bagpipe inflated while playing. Assuming you are not new to piping and are just "getting your chops up," then there's a chance that bagpipe has a leak somewhere or your drone reeds are not set efficiently. 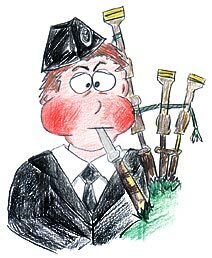 This page will guide you through the steps to troubleshoot your bagpipes for this problem. Tracking down the issues of an inefficient bagpipe. There is nothing too mysterious about how a bagpipe works. Air goes in, air goes out. If a bag is not maintaining nominal pressure during performance, it's one of two things: not enough air going in or too much air coming out. If it's the former, the player simply has to blow deeper or more often to increase the flow of air into the bag. If it's the later, one needs to isolate the problem with the instrument itself. Whatever you do, resist the temptation to dunk your pipes into a full bathtub to look for air bubbles. This is very risky and may result in cracked wood and a stiff hide bag. Even if your bagpipes are fully synthetic—plastic stocks/drones and Gortex or similar bag and doesn't have any rustable metal fittings—still resist the temptation. Soaking is detrimental to glued seams found on many synthetic bag seams. The other problem with dunking is that the materials are all somewhat breathable, that is, if you wait long enough, you'll see small air bubbles all over the bag surface. Dunking a bag will also violate the warranties of some bagpipe bag manufacturers. Before embarking on all these items, if you are using a hide bag and it's been a while since you've seasoned it, start by doing a seasoning and see if that solves the problem. Fully and closely inspect all your stocks, blowpipe and lower drone sections for cracks. Hairline cracks can sometimes be resealed by oiling. Larger cracks need to be repaired and may require the attention of a professional bagpipe repair service. Fully and closely inspect your bag seams. Look for beads of moisure after playing. Look for loose or missing stitching. Look for anything out of the ordinary—mouse nibblings, for instance! Fully and closely inspect the bag around all your stocks. Make sure the bag has not slipped out from under the tie-in cord (or whatever method you are using to hold the stocks in the bag). Also look for tears or holes in the bag due to wear by rocking the stock around to make any such flaws apparent. Grip the stock with one hand and the bag itself with the other. Try twisting the stock. If it doesn't turn, that's a good sign. If the stock turns or if there are any gaps, resecure the stock to the bag. 1) Remove all the drones and the chanter. Plug all the stocks tightly with corks. (Rubber corks/stoppers are preferred to natural corks since the rubber stoppers are more airtight.) Inflate the bag. Listen to make sure all the corks are sealed well. 2) Fully inflate the bag, set it down, and press it down with your hand. The bag should stay fairly hard for at least a minute or two before you notice any change. If it does stay hard, any problems are most likely outside the instrument, that is, the piper. (But also make sure the valve doesn't suddenly fail at a lower pressure for some oddball reason.) If the bag deflates relatively quickly, the problem is either the blowpipe valve, the blowpipe hemping, the stock tie-ins, or the bag itself. 3) Checking the blowpipe: With the bag fully inflated, check the blowpipe valve by holding the opening to your ear listening for escaping air, as well as slightly wetting your cheek and feeling for a chill. If you hear/feel air escaping through the blowpipe, fix or replace your valve. Make sure your mouthpiece is securely screwed onto the blowpipe. Also make sure the blowpipe is well sealed in its stock. It should not be loose, but snug. This is the most variable hemping in the entire bagpipe due to the proximity to the piper's mouth—a fair amount of swelling and shrinking occurs due to moisture. After a while off the pipes, it's not unusual for the blowpipe to easily slip out of its stock. Check it every time you play. If it swells too much, it can crack the stock. If you are using some kind of moisture control system in your pipes, it may be less of an issue, but it's still a good idea to check. 4) With all your stocks still corked, remove the blowpipe and pour about 12 oz (350 ml) of lukewarm water into your bag. Replace your blowpipe and inflate. Rock your bag around then look carefully for escaping water. Rotate the stocks around to open up any possible tears. Notice if the bag suddenly deflates quicker and/or moisture escapes when you have one of the stocks tipped into a new position. If you still don't experience any problems, fully drain your bag and move onto step 5. If you don't notice any water leaks but your bag is deflating quickly and you've determined that your valve, stocks and tie-ins are fine, then your bag is probably still the culprit and needs replacement (or seasoning if it's hide and you skipped that step). Even if it's a new bag, it may be defective. 5) Check the fit of each lower drone section into its stock. The drones should require one hand on the drone and one hand on the stock to fully seat the drone into the stock. If it can be inserted completely with one hand, it's too loose. Insert one lower drone section, plugging the end of the tuning pin with a very small cork. (A variety of cork sizes are usually found at a hardware store.) Repeat the "inflate bag, press with hand" exercise. If the bag holds pressure, proceed to the next lower drone section, each in turn. If the adding of a particular drone section compromises how long the bag can hold air, then most likely the hemping on the drone's bottom tenon is the issue and should be redone. 6) Check the chanter hemping. Plug the chanter's reed seat using either a old chanter reed plugged with wax in the staple or a rubber stopper (a Piper's Pal stopper works great). Repeat the "inflate bag, press with hand" exercise. If the bag loses pressure, you may need to rehemp your chanter's tenon. If the bag holds its pressure then move on. There are only so many ways that air can get out of your bag. But if it is getting out in a manner you don't want, it can make your life miserable. It pays to have an air efficient bagpipe. If you have comments, suggestions, additions, etc., please contact me. This page last updated Saturday, April 24, 2010. Page first created in January 15, 2005.